Fiction – paperback; Vintage Classics; 192 pages; 2008. Ever since I read Richard Yates’ The Easter Parade, I’ve wanted to read more by this very talented and much respected American author. And so, a week or so ago — during a long four-hour layover at Bangkok Airport, en route to Phnom Penh — I settled down with Cold Spring Harbor, which was first published in 1986 and turned out to be the last novel before he died (in 1992, aged 66). Set in the mid-1930s, just before the war and during it, it tells the story of two families — the Shephards and the Drakes — and their unlikely coming together. The lynchpin of the story is Evan Shephard, a good-looking man with no direction and a deep love of automobiles, who meets young Rachel Drake by chance (his car breaks down, en route to New York, outside her childhood home) and later marries her. He already has one failed short-lived marriage behind him, and a young daughter, but his parents hope this will give their only son the fresh start he needs. Later, when war breaks out, Evan is rejected because he has perforated eardrums, a decision that delights his wife (because it means he can stay at home) but disappoints his father (a former Army captain who had hoped a stint in the army might help his immature son grow up). To save enough money to fund future university studies so Evan can become an engineer rather than a machinist, the couple move in with Rachel’s mother, the larger-than-life socially needy Mrs Drake, in a small house in Cold Spring Harbor, not far from where Evan grew up. Rachel’s younger brother still lives at home when he’s not at boarding school, so the house is relatively crowded (and damp). Thrust together in this way, the tensions between everyone fester and stretch to breaking point. The novel is at its best focusing on these relationships, examining in almost forensic detail the ways in which they begin to unravel, but also honing in on the strained contact between the in-laws and the even more strained relationship between Evan and his father. It’s an immensely readable book, because even though nothing much happens plot wise, the characters are so well drawn, so believable and so intriguing you get completely drawn in to their domestic dramas. Yates is brilliant at showing the inner-workings of the human heart and mind. His characters are deeply flawed, full of doubts and self-delusion, quietly getting on with troubled lives but never quite having the confidence (or financial backing) to make something better of themselves. He’s just as good at writing about troubled teenaged boys as he is young women, and the cast of characters in this novel provide more than enough material to showcase this extraordinary ability. 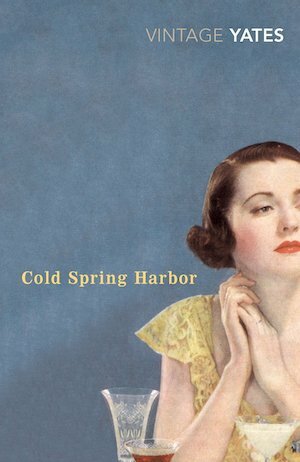 Cold Spring Harbor could be described as a portrait of a marriage, but it is so much more than that — it’s also a wonderfully insightful examination of parental expectations and how families exert a hold long into adulthood. I loved it. What better way to spend a layover! Ha! I was very tired having been up since 5am and on a plane for 6 hours (from Abu Dhabi) but I did manage to get a good way through this book. Have you read it? No, I’ve only read Independence Day but I loved that one. He’s not an author that is in our shops, not that I’ve seen. In that case I’ll give you this one when I see you… save me from carting it back to the UK and taking up valuable luggage space! Yates is such a brilliant writer and like you, it’s been a while since I read him. This sounds wonderful. I’ll have to dig him out of the TBR! I’m keen to read more now… I’d be surprised if he wrote any duds. I’m so glad to hear that you loved this. As you say, he writes about these characters and their deepest emotions so well. Few writers capture the pain of loneliness and and alienation as acutely as Yates. Thanks Jacqui. He really is a brilliant writer. I love that even though he writes about sad subjects he doesn’t resort to sentimentality. I do need to read more by him. Probably best known for ”Revolutionary Road” which became a fine movie; the novel is a real classic. Also a marvelous short-story writer, check out his ”Eleven kinds of loneliness” (what a title!). I must track down the rest of his works, like this ”Cold Spring Harbor”. Thanks Farbror. I’ve seen the film Revolutionary Road and it was so harrowing I couldn’t bring myself to read the book ☹️ but maybe I will now. And yes, Eleven Kinds of Loneliness is a great name for a short story collection! I’m pretty sure I’ve read this one though I can only remember the beginning. He’s a great writer isn’t he? I’ve just finished Eleven Kinds of Loneliness and I’m considering reading his other short story collection, Liars in Love, soon. I haven’t read a dud by him yet.